Specially designed using superior quality raw material, we offer a wide assortment of flexible Pin Bush Couplings. Designed in compliance with the international standards, our range of pin bush couplings is highly acclaimed for abrasion resistance, corrosion resistance and precise dimensions. Incepted in the year 1963, B. V. Transmission Industries have with us industrial experience of more than 45 years in the field of fabricating an extensive range of Industrial Components that includes Industrial Pulleys, Spring Mountings, Mechanical Worm Gears, Chain Sprockets and other components. Widely used in engineering and other industries, entire range is offered in different finish specifications to meet the diverse requirements of our customers. We carry a ready stock of " to 2" Roller Chain & up to 6" Conveyor Chain. 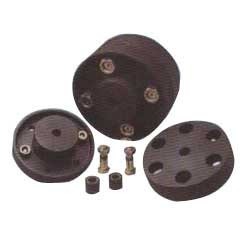 Our customers can also avail conveyor sprockets in the capacity range of 3/8' pitch to 2.5' pitch. To order products, we offer service of phone ordering, absolutely free of charge. Technical services and on line customer services are also offered by us. Our flawless range is highly acclaimed across several countries such as China, Dubai, UK and other European countries.